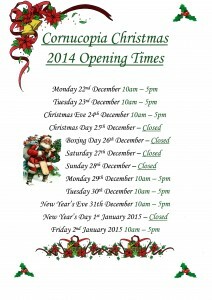 Christmas Opening Times plus Late Night Opening at Cornucopia! Christmas is creeping up on us, so I thought I’d give you all a heads up of our Christmas opening times. Any ‘last minute’ shoppers out there will be pleased to know that we will be open until 5pm on Christmas Eve!! We will also be open for late night shopping on Friday 5th, Friday 12th & Friday 19th December.